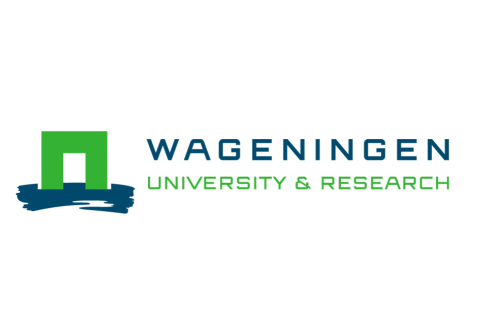 Ewout Frankema is Professor and Chair of Rural and Environmental History at Wageningen University and elected member of the Young Academy of the Royal Dutch Academy of Arts and Sciences. His research agenda focuses on a deeper understanding of the long-term comparative economic development of developing regions (Africa, Latin America, Asia) and the historical origins and nature of present-day global inequality. Jeffrey Williamson is Laird Bell Professor of Economics, emeritus, Harvard University and Honorary Fellow, University of Wisconsin-Madison, Economics. 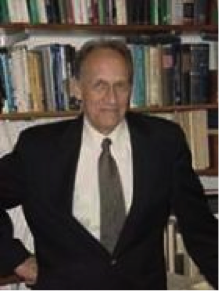 He served as president of the Economic History Association (1994-1995) and Chairman of Harvard’s Economics Department (1997-2000). He is a specialist in economic history, development, and trade and has published more than 30 books and 200 articles. 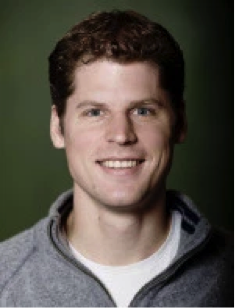 Pieter Woltjer is a post-doctoral researcher at the Groningen Growth and Development Centre. 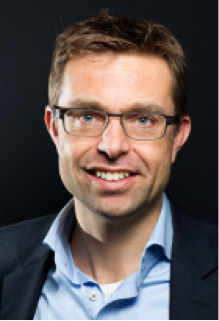 As an economic historian he has worked on topics ranging from the study of productivity growth in the United States, the diffusion of technology in Europe, to the impact of international trade on development in Africa. This article scrutinizes the economic motivations for the scramble of West Africa – the region where trade with Europe was most intensive – by zooming in on trade developments in sub-Saharan Africa in the long 19th century, and by assessing these trade developments in a global comparative perspective. Our overarching argument is that trade developments from the mid-1830s to mid-1880s did more to strengthen the economic rationale for the scramble than most of the historical literature has hitherto assumed. It is a commonly held belief that African markets were too insignificant to lure major European powers into a large-scale military conquest. 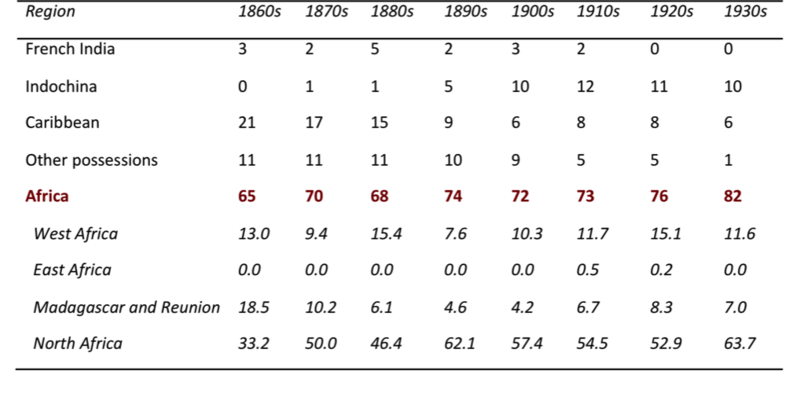 We show that British-African trade indeed comprised a tiny share of total British imperial trade, but that the share of West African exports in total French imperial trade was significant and growing (see Table 1). Afro-European trade patterns in the 19th century were thus consistent with the French initiative in 1879 to survey the possibilities of connecting the Middle Niger Delta to their commercial entrepôts on the Senegalese coast. 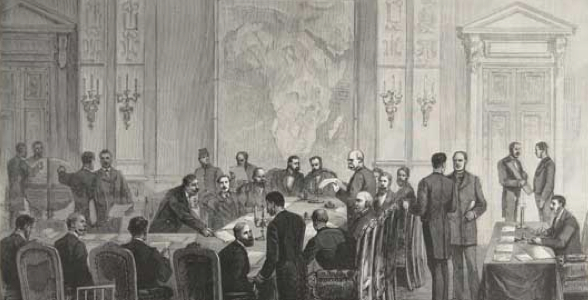 We do not claim that 19th-century trade developments fully explain the scramble for West Africa, for national political prestige, intra-European tensions, religious zeal, and, indeed, internal African politics all played their part. What we argue is that during the 19th century the costs of colonial conquest were declining as a result of innovations in transportation, communication, military, and medical technology, while the revenues of legitimate commerce were rising, thus narrowing the gap between costs and benefits of colonization. In other words, the 19th-century commodity export boom was crucial in shaping an economic context in which the partition of Africa became politically defensible. 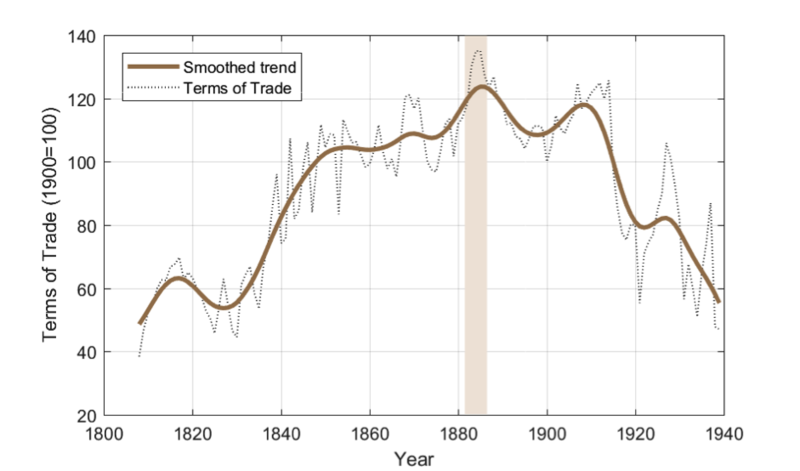 Revisiting older work by Eltis and Jennings (1988), we found a prolonged rise in the net barter terms of trade (NBTT) for sub-Saharan Africa from the 1800s to the 1880s . Figure 1 shows that this secular price boom peaked around the date of the Berlin Conference for West Africa (1884-5), which quickened the European partition of Africa. This runs contrary to Hopkins’ (1973) argument that the scramble was provoked by internal African conflicts emerging from a notable drop in the terms of trade after the 1860s. After the Berlin Conference, however, the relative prices of major African export products started a prolonged descent. This price bust continued, with only some temporary reversals, up to the eve of World War II. In 1940, Africa’s terms of trade were back at their 1800 levels. What did West Africa’s commodity price boom look like in a global comparative perspective? While the terms of trade for commodity exporters were rising in most of the non-Western world, the African boom was larger than elsewhere, and showed in both increasing export volumes and increasing relative prices of African exports. 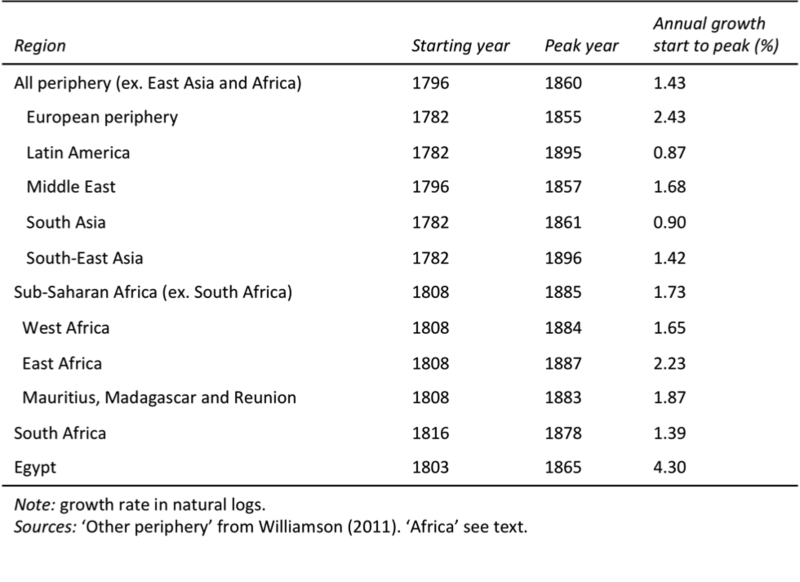 As Table 2 shows, the average annual growth rate during the boom years in the European periphery, Latin America, Middle East, South Asia, and South-East Asia was 1.4% (Williamson 2011). The figure for West Africa was even higher, 1.7% per annum. West Africa also enjoyed its boom a couple of decades longer than the average commodity exporter in the poor periphery. Our NBTT estimates reveal that the boom was stronger and more prolonged than envisaged by Hopkins (1973) and Eltis and Jennings (1988). Thanks to the commodity export boom, Africa’s share of world trade kept rising up to the early 1970s, when its share started to decline. The long rise itself is not surprising. Africa was the last major world region to be unlocked by railways. Yet, globalization-induced specialization in primary products also meant greater price volatility, and this compounded the divergence in growth rates during the twentieth century. African export prices collapsed again during the 1970s and only started recovering around 1995–2000. How long Africa’s commodity boom will last this time is difficult to say, but one thing seems clear: the recent rise in African terms of trade is far more modest than the 1835–1885 boom. Eltis, David, and Lawrence C. Jennings (1988). “Trade Between Western Africa and the Atlantic World in the Pre-Colonial Era.” American Historical Review 93(4): 936–59. Frankema, Ewout, Jeffrey Williamson, and Pieter Woltjer (2018). “An Economic Rationale for the West African Scramble? The Commercial Transition and the Commodity Price Boom of 1835-1885.” The Journal of Economic History 78(1): 231-267. Hopkins, Anthony G (1973). An Economic History of West Africa. London: Longman. Pakenham, Thomas (1992). The Scramble for Africa: The White Man’s Conquest of the Dark Continent from 1876–1912. New York: Avon Books. Williamson, Jeffrey G (2011). Trade and Poverty: When the Third World Fell Behind. Cambridge, MA: MIT Press. The commodity or net barter terms of trade is the ratio between the price of a country’s export goods and import goods.